← Yes, September’s astrology perfectly reflects the [CRAZY] times! The “hidden agenda” is much deeper and dangerous than anyone knows. Unlike most of our exposés, this piece will be relatively short and simple. Nevertheless, it represents an extremely important aspect of the ongoing NFL fiasco-conspiracy-insurgency. Of course, the hidden perps who conceived this fake protest did so with many goals in mind, as they always do when running a social engineering experiment on the American people. The New World Order globalists know that the best way to tear down a nation is to eradicate its history, its heroes, its culture, its traditions, it symbols, its values, it founding principles, its customs, its statues, its flags, and, of course, its patriotic songs and anthems. Just as the ISIS terror groups destroyed Syria by blowing up mosques, stealing all the artifacts, knocking down statues, and looting the cultural centers, Soros & Company plans to do the very same throughout the United States of America. There are literally hundreds of Soros-sponsored organizations whose primary goal is the destruction of American society. These quite deliberate seditious acts are a precursor to the planned Purple Revolution. The statue destruction that began with the Charlottesville protest accelerated the process of erasing the Confederacy from U.S. history. The same instigators even talked about removing the Thomas Jefferson Memorial from Washington, D.C. Then they started the discussion about how George Washington had also lost the respect of the American people because he was a slaveowner. This pre-planned strategy of cultural destruction saw a rapid acceleration with the fake protests which saw NFL football players used to do the dirty work of the globalists. Truly, these high-paid gridiron gladiators have no idea that they are being used to disrespect the national anthem and American flag. They have all been manipulated by the owners and managers who also don’t know what is really going on. The agency system, which has always been firmly in place to control professional athletes, is the primary means by which these football players are coerced. It’s very easy to take a malleable group of NFL players, many of whom have chronic traumatic encephalopathy from repeated concussions on the field, and corral them all in the same pen of political correctness. That’s exactly what they have done. The social pressure alone was enough to herd them all into the same paddock of conformity and obedience. 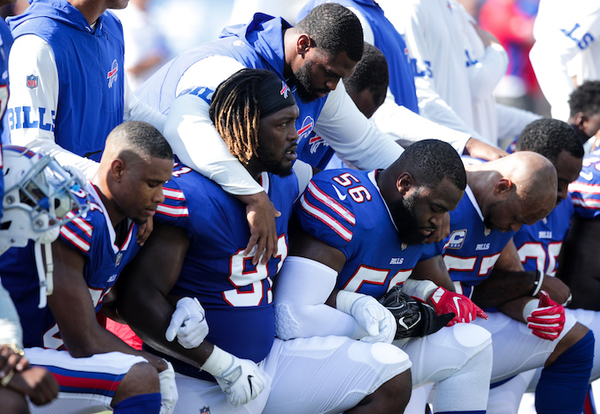 Once the conspirators got a critical mass of NFL players to kneel during the anthem, they realized the other professional sport teams in the NBA and MLB would follow suit. And so they are. In just one short week, virtually the entire NFL was used to trash the anthem and the flag of the American Republic. It is this ultra-permissive attitude that has empowered the many liberal groups on the Left to demand their freedoms. They incorrectly insist that the U.S. Constitution grants them freedom to do anything they want. Anywhere and anytime they want to. It’s as though their “pursuit of happiness” trumps everything else in society even when it is clearly against the greater good. This exceedingly deluded crowd of liberals and lefties, progressives and Democrats has no understanding that the greater the freedoms, the greater the responsibility in the proper exercise of those freedoms. Hence, they look for every opportunity to act out their gross self-deception wherever and whenever they can. 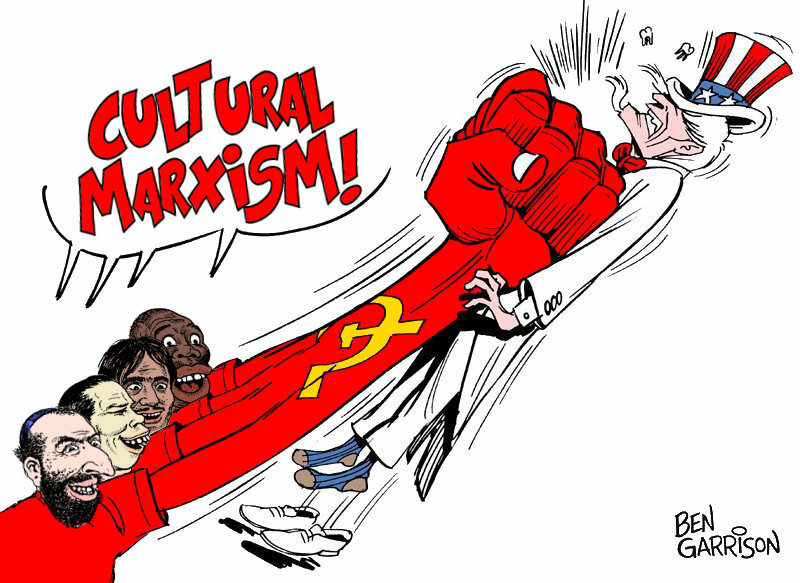 While the Democratic Party was chosen long ago as the primary institutional instrument by which Cultural Marxism would be implemented nationwide, the GOP is also fully on board. This is the very reason why Congress has thwarted President Trump’s mildly conservative agenda at every turn. Every nationalist initiative is met with extreme resistance and political interference. My wife and I live right in the middle of college football country. The day we moved to the college town was the scariest day of our life together. As we drove into the city to move into our new home we were confronted with a MASSIVE exodus of traffic leaving the city. For miles and miles we were the only ones driving into town; everyone else was leaving. We were literally alone on our side of every highway and city street as we approached our home. All we could think of was that there was a terrorist attack, or bomb scare, or overturned railroad cars with dangerous chemicals spilt all over the place. Little did we know it was just the Saturday college football game that just finished. Such was our crash course in the intensity of football fever, especially in college towns. We saw that the big cities had their own football mania toward their pro teams. However, the longer we lived in the very heart of Deep South football culture, the more we realized it was serving a very important purpose for society. For football (and basketball and baseball, etc.) serve as an excellent vehicle to channel aggressive/violent/destructive energies in a constructive and socially acceptable way. Given the anger and frustration associated with post-modern society, pro sports spectatorship can be a very effective means to vent, even if it’s done vicariously through the players on the field. In this regard, the professional and college players are actually sacrificing themselves for the rest of us. Some here understand somewhat the grand-scale societal function of spectator sports. They provide a means of capturing the energies of tribal instinct, and releasing them in a manner that is typically non-destructive. The local sports team provides the people something regional with which to identify, and the games offer a means of playing-out the will to dominate. Although I mostly don’t enjoy watching sports, I understand the role spectator-ship plays, that it can be both beneficial (from an almost cynical perspective) or harmful depending on circumstances. What many here might not understand are the full implications, and “why”, of recent events surrounding various sports leagues and organizations, particularly NFL, in consideration of recent political and social turmoil. -Works closely with DHS and FEMA, having formed partnerships with both agencies. These facts pretty well establish that NFL is a servant of Deep State, not only being tax-exempt, but supporting and receiving the support of agencies which the Deep State has burrowed deep within. The answer is fairly clear as to what forces are involved in, and the effects of, the NFLs ‘take a knee’ anti-national political controversy. The bigger question is “Why?”. The good news is that it looks like there is a sufficient number of patriots and nationalists who will defend the Republic from these budding Bolsheviks. More importantly, it also looks like the NFL is in a “crash and burn” mode that may very well take it down for good as an influential “celebrity society”. Not only that, the kneeling disrespect will likely catch on within the NBA and MLB so that those two institutions are also likely to “crash and burn” where it concerns their celebrity status. The NFL crashes and burns! Collapse of the celebrity culture now inevitable. However, the real good news is that once this pillar of the celebrity society — professional sports mania — has crumbled, the other two main pillars will also fracture and fall. That would be Hollywood and the Music Industry which now fabricate fake celebrities as quickly as cow paddies are made.